A cyclist was hit and pinned underneath a white Chevrolet SUV at the intersection of Circle Road and Roosevelt Drive at approximately 3:45 p.m. on Saturday, Sept. 21, according to officials. Residential student Robert Capuano, the cyclist, was taken by Stony Brook Volunteer Ambulance Corps to Stony Brook University Hospital. According to Assistant Chief of Police Lawrence Zacarese, the biker sustained minor injuries. It is unclear how long the biker was under the SUV. The driver, commuter student Anastasia Ambrosio, was evaluated at the scene by the Stony Brook Volunteer Ambulance Corps and was not injured, according to Zacarese. Lieutenant John Stankaitis said the investigation is ongoing, and Zacarese said more information will be released as it becomes available. 10:20 a.m., Sept. 23: As of 7:23 p.m. on Sept. 22, Robert Capuano, the cyclist, was at Stony Brook University Hospital as an admitted patient, according to Assistant Chief of Police Lawrence Zacarese. Capuano’s class year at Stony Brook and major are still unknown. The driver of the white Chevrolet SUV was identified by Zacarese on Monday as commuter student Anastasia Ambrosio. “There are no pending charges in this incident,” he said. 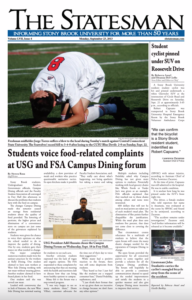 7:47 p.m.: Stony Brook Volunteer Ambulance Corps President Roxana Mehran said when the biker was transported to Stony Brook University Hospital, he or she was in stable condition. 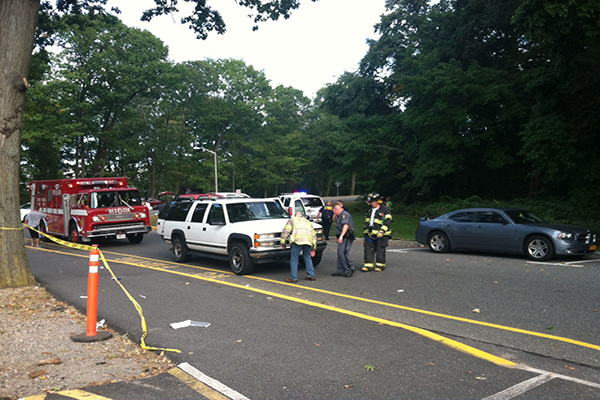 Assistant Chief of Police Lawrence Zacarese said the biker sustained minor injuries. The biker’s identity is still unknown. Zacarese also said the driver was evaluated at the scene by SBVAC and was found to not be injured. The time of the accident was confirmed by Zacarese to be at approximately 3:45 p.m.
5:21 p.m.: The Statesman previously reported the cyclist was heading toward Engineering. It is unclear what direction the biker was heading in. The cyclist was pinned underneath the front right tire of the SUV. The scene has been cleared and traffic flow is normal. The Statesman published this piece in print on Sept. 23, 2013. 5:05 p.m.: A cyclist was hit and pinned underneath a vehicle at the intersection of Circle Road and Roosevelt Drive earlier this afternoon, according to officials. The cyclist was hit when approaching the bike path near Engineering by a white Chevrolet SUV. The biker was taken from the scene in an ambulance. It is unclear how long the biker was under the car, the extent of the biker’s injuries or the biker’s identity. Lieutenant John Stankaitis said the investigation is ongoing and the police are not ready to give a statement. 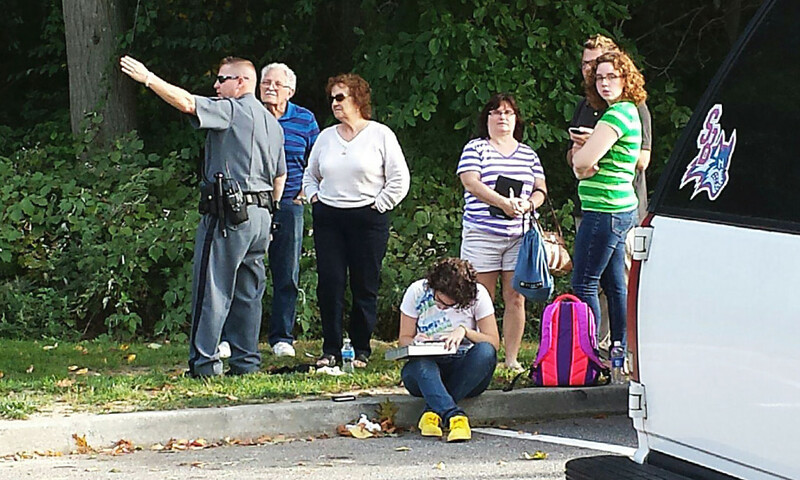 The driver, a female student who said her name is Anastasia, was not injured. There was no damage to the SUV. The bike, a Cannondale, was destroyed. Police are directing traffic at the intersection.